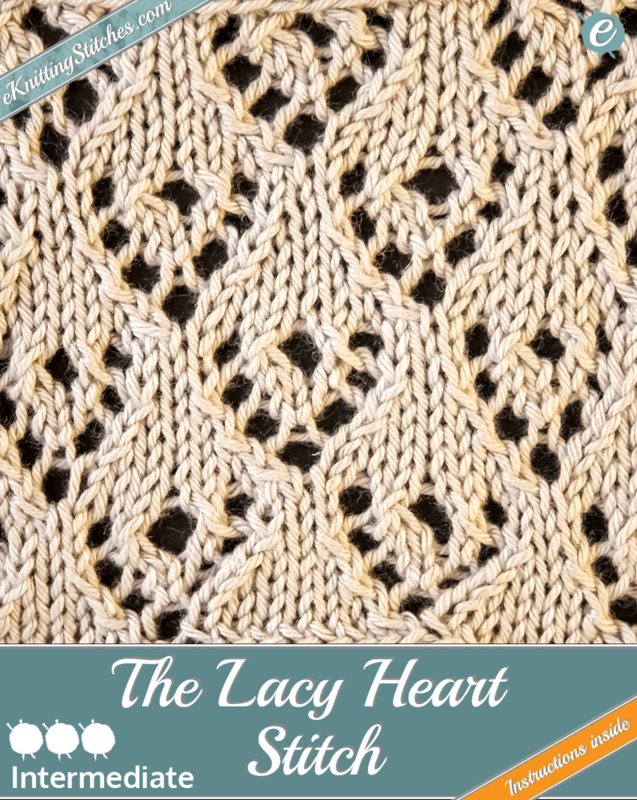 The Lacy Heart Stitch uses Eyelet & Lace techniques to create a fabric of (as the name would suggest) small eyelet heart shapes. I don't know about you, but this stitch screams "Babies Blanket" to me. Of course, this stitch would work well on any other light-weight garment, like a child's cardigan or for a summer scarf. This stitch is not too tricky, but you need to keep an eye on where exactly you are in the pattern. There is nothing worse than getting lost! Cast on any multiple of eight stitches for your project. 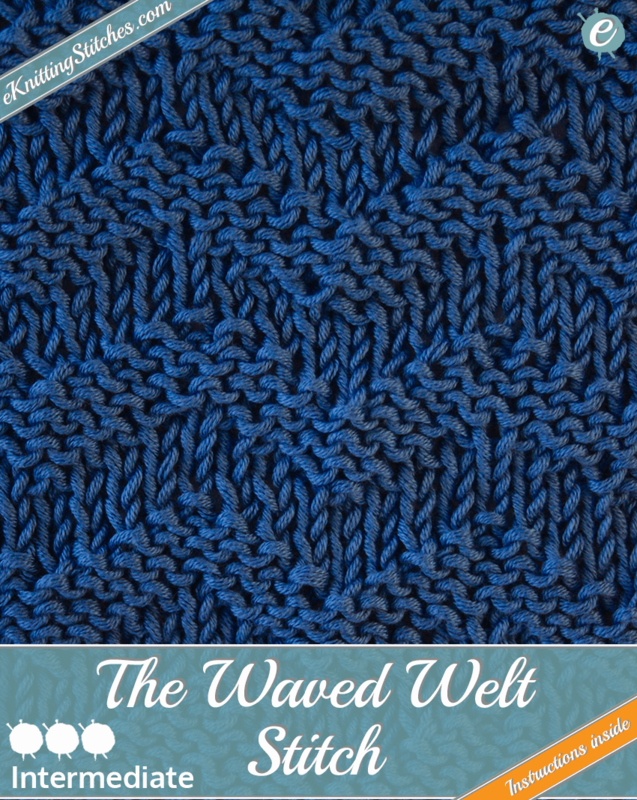 The Waved Welt Stitch uses a series of Knit & Purl stitches to generate a series of continuous wavy W's. This stitch is an excellent choice for adding a bit of detail to what could otherwise be a rather dull stockinette/garter stitch area of a large project such as a throw or a jumper. As this stitch is just a combination of simple knit and purl stitches, it is very straightforward to do for the beginner knitters. Just be careful to keep up with where you are in the pattern otherwise, you may end up with some wonky looking welts! 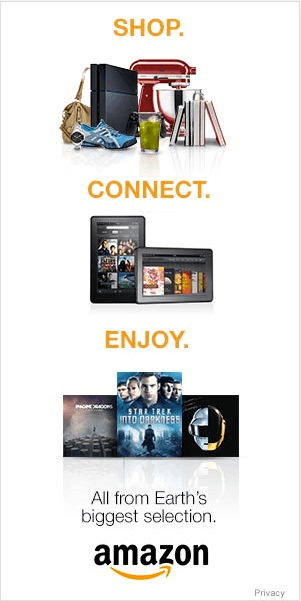 Cast on any multiple of eight stitches plus one for your project. 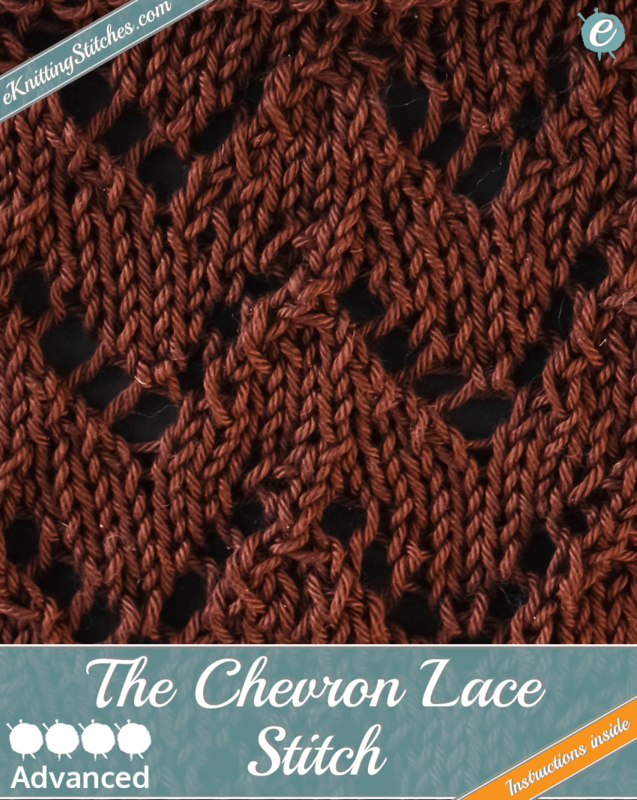 The Chevron Lace Stitch is an Eyelet & Lace stitch that adds some slightly more complicated increase/decrease techniques to generate a lace Chevron effect. If you are looking for something for a light-weight shawl or pullover, then eyelet & lace stitches are particularly appropriate, especially when paired with a less elastic yarn like cotton to create a chic draping effect. As with most Lace stitches, there is a lot of increasing/decreasing involved in pulling off this pattern. In particular, for this pattern, there are a couple of "not so standard" increase/decreases so as ever, please, please, please. Make sure you fully understand the different techniques required before you begin knitting! Cast on any multiple of eight stitches plus one for your project. Pay attention to rows nine and eleven, you will increase by one stitch (for a nine stitch repeat) in row nine, and then decrease by one stitch (returning to an eight stitch repeat) in row eleven respectively. 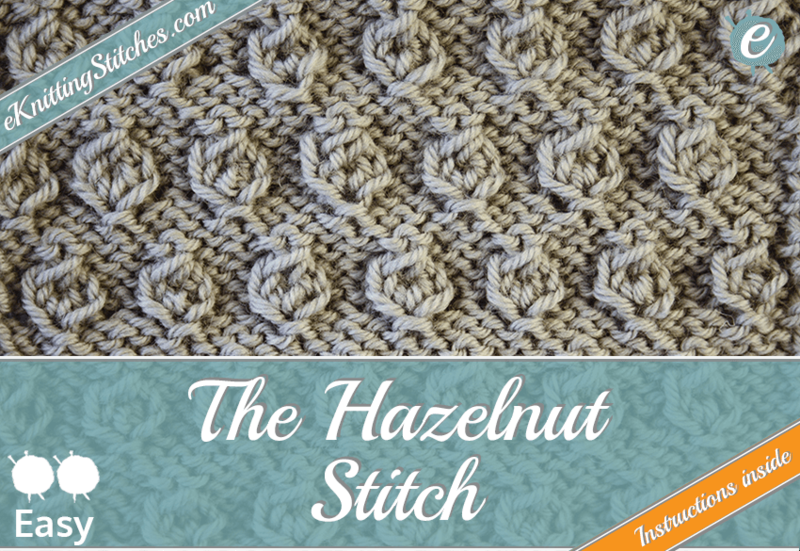 The Hazelnut Stitch uses Knit & Purl and increase/decreases to create a flat/broad knot that looks embossed. This stitch is an excellent choice for adding a bit of raised texture to any sweater, cardigan or hat. Cast on any multiple of four stitches for your project. 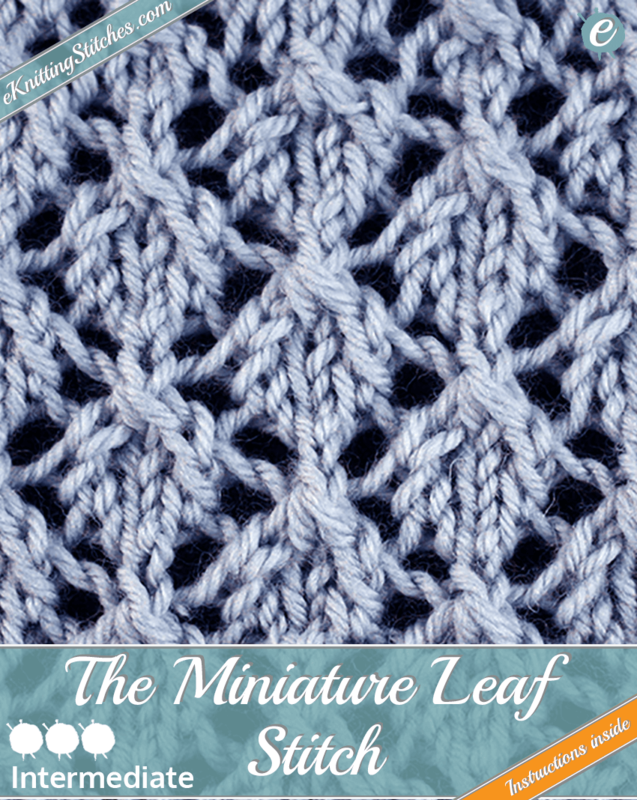 The Miniature Leaf Stitch uses Eyelet & Lace techniques to create a fabric of (as the name would suggest) small leaves. Simply an excellent choice for light-weight cardigans or scarves, particularly when paired with a less elastic yarn like cotton to create a chic draping effect. As with most Lace stitches, there is a lot of increasing/decreasing involved in pulling off this pattern. Please, please, please. Make sure you fully understand the different techniques required before you begin knitting!